Our recent CSA deliveries have been filled with an array of gorgeous organic apple varieties, so we’ve been enjoying plenty of these healthy apple muffins, apple German pancakes, and this classic homemade applesauce recipe. I love easy recipes like this that my kids just gobble up! 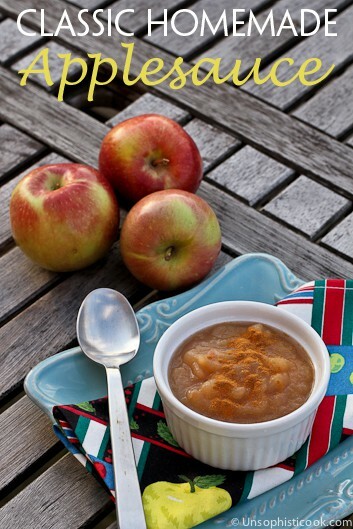 Added bonus — applesauce is one of those sides that goes well with anything. I did try something a little different with the batch I made today. I read about how Amy at The Finer Things in Life doesn’t peel her apples when making applesauce, so I gave it a try. Unfortunately the results were mixed in my household. The peels didn’t quite melt into the applesauce all the way, so a couple of my kids weren’t keen on the added texture. We’ll probably go back to peeling our apples, but if your family likes applesauce on the chunky side, by all means save yourself some work! If you don’t have an immersion blender, now would be a great time to add one to your Christmas list! I have this Breville Control Grip Immersion Blender, and I absolutely adore it. You could certainly find a cheaper alternative, but I think it’s worth every penny. This recipe makes quite a bit, but the good news is it keeps in the refrigerator for up to a week. Or you can freeze it for up to a year! 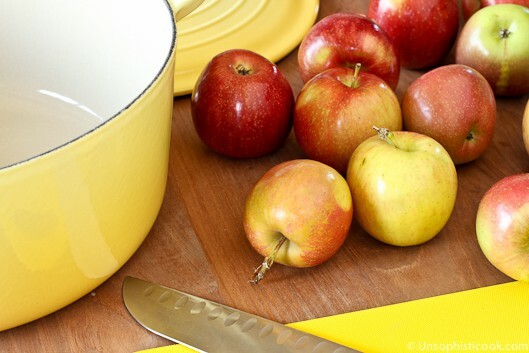 Core, peel (optional), and cut the apples into chunks. 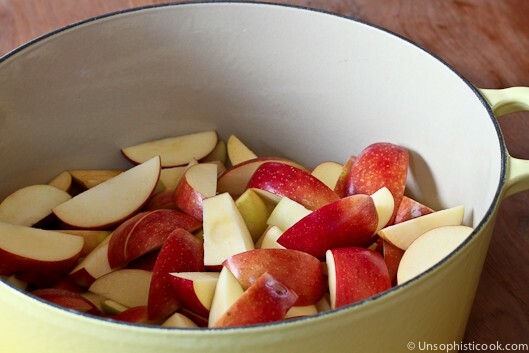 Place apples and the rest of the ingredients in a large pot. Bring to a boil. Then cover and simmer for 20 to 30 minutes. Remove from heat. Blend with an immersion blender or puree in batches in a food processor. My apple bounty is here and I can’t wait to make applesauce to enjoy all winter long. Beautiful photos! I just bought 18 pounds of red delicious apples. I have made sauce before, but haven’t used red delicious before. Has anyone? I make applesauce every year. It is so easy! I don’t add any sugar or spices – straight applesauce. It is very helpful to victorio strainer to mash the apples. All you have to do is cut the stem and blossom ends off, cut up the apples, cook them down, and put them in the strainer. As you turn the crank, the skin and seeds come out one way and the applesauce the other way. I then use a water bath canner to can the jars. Here is one from amazon.com. You can also google it and see how it works. http://www.amazon.com/Victorio-VKP250-Model-Strainer-Sauce/dp/B001I7FP54 You can also use an old fashioned food mill. It is more work but still makes great applesauce! You know, I think my mom might have one of those, Terry. Thanks for reminding me of it — I’ll have to ask her! If you have a food mill (I have an old fashioned Foley Food Mill), put the apples (with peels) through that. Then you get the color and vitamins in the peel without the peels being in the applesauce. This looks so comforting, great for this time of year! Oh my goodness, I bet your house smells heavenly, Tara! Yum! I love making things like applesauce from scratch. And I’m with Paula – I bet your house smells amazing! I can smell this cooking right now. Love. Yum! 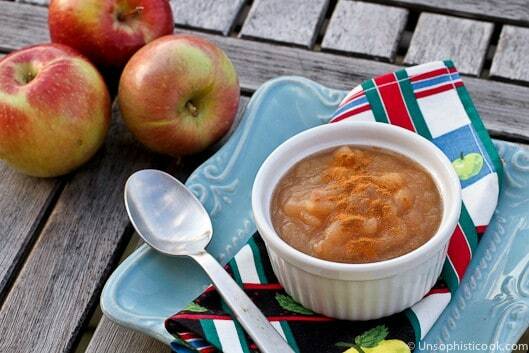 I’ve never made homemade applesauce- looks great! I love homemade applesauce. We just had a jar over waffles the other night. So good. Luckily I have an a bushel of apples just waiting to be sauced!